When the colder temperatures set in, comfort food is key, but finding an easy recipe that’s delicious and satisfying can be a challenge. Soup is generally a go-to for the fall and winter months, especially if you’re in an area that suffers through a snowy season, and this recipe for a hearty option is both impressive and filling. It all starts with three pounds of onions. 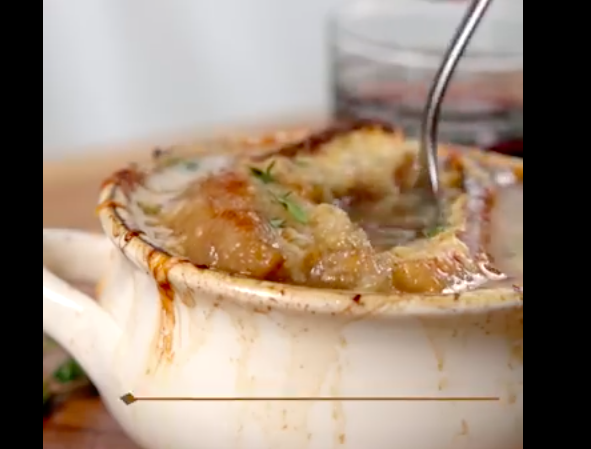 It’s definitely a lot of onions, but this French Onion soup recipe puts your slow cooker to work, so those onions cook down over a very long period of time. The 16 hours of cooking time is definitely well worth it for the amazing results. The crockpot recipe comes courtesy of Tip Hero, who lays out the simple ingredient list and process involved. You can let the first step cook away overnight and wake to the most delicious smell in your home, then move on to the next of instructions in the morning before you head out the door for work, adding the additional ingredients and setting it to cook on low all day. Place the onion slices in a 5-quart crockpot, add the butter, olive oil, salt, and black pepper. Cook, covered, on low overnight or for 10-12 hours. At the end of the cooking time, the onions will be dark golden brown and soft. Add the beef broth, balsamic vinegar, and fresh thyme. Cover and continue cooking on low for 6 to 8 hours. At this point, you can add ⅓ cup brandy for a deeper flavor. Next, you’ll need to assemble the soup in bowls and cook in the oven. Preheat the oven to 350 degrees Fahrenheit. 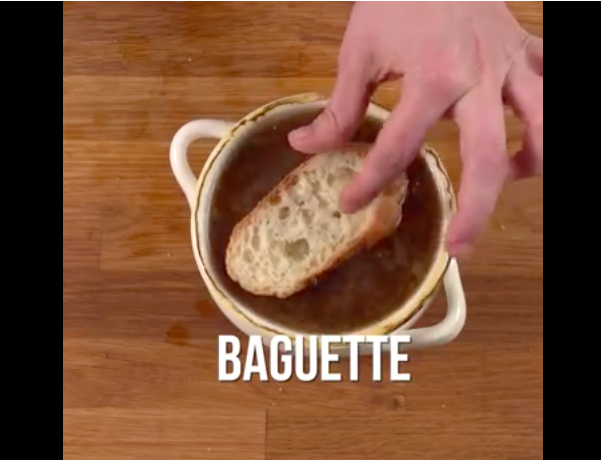 Ladle the soup into oven-safe bowls and top each with a baguette slice and shredded cheese, then place on a baking sheet. Bake for 20 to 30 minutes, until the cheese is melted. For a final finishing step that really gives the soup that look we all know and love, place it under the broiler for 2 to 3 minutes to get the cheese bubbling and browned. Let cool slightly before diving in — you won’t be disappointed! 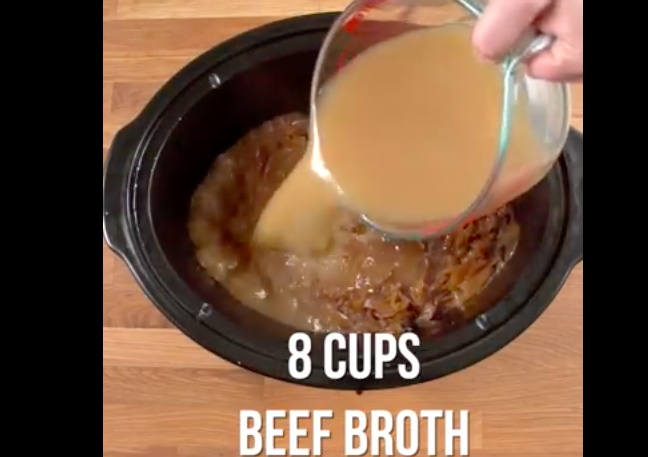 Many people weighed in with comments on social media about the soup, with some commenters believing that the whole process takes too long, however, others noted that it’s definitely a great recipe. 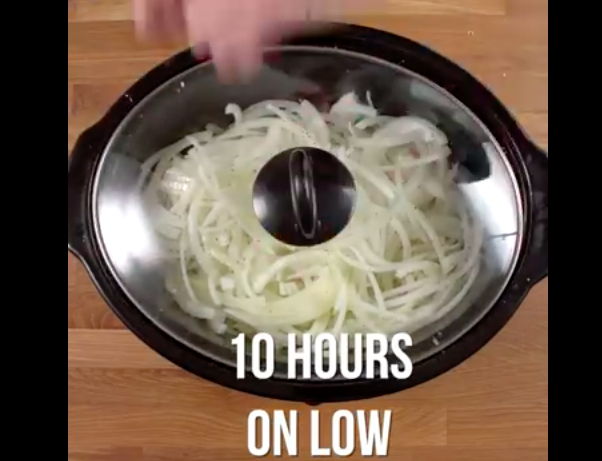 One person added an option for cutting your cooking time in half — just turn up the slow cooker to high!